A 81 yo old lady presents feeling decidedly crook. She feels wobbly on her pins and has fallen over a few times in the least 3 days – thankfully on carpet and she’s uninjured. Very slow. P waves seen, map out p waves no relation to qrs. Complete heart block. Peaked t waves. I would get a gas check k if poss. Would try some calcium. If k ok and no response to calcium. Atropine, transcutaneous pace. Ref to cardiology/ccu needs pacing. Mapping out the p waves is very important because at first glance, some may think this is a very long first degree AV block. The p rate is actually much faster than the QRS rate…if you look at leads II and III you can see that the bump at the end of the QRS complex is not an R’ wave but a p wave. This AV dissociation proves this is 3rd degree AV block. 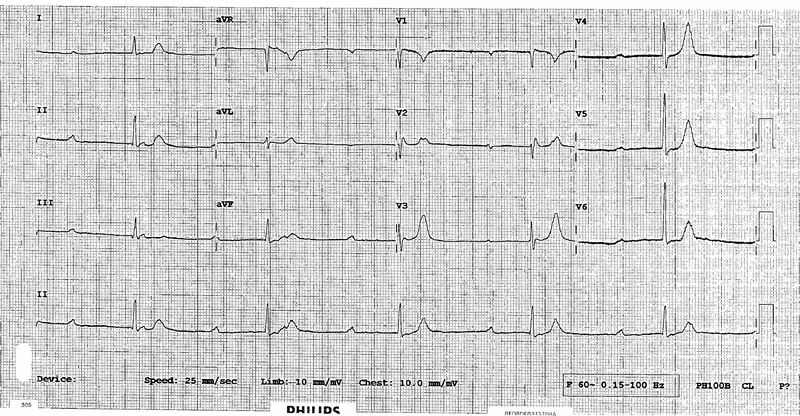 At this rate you would assume the escape rhythm is of ventricular origin but it is not as wide and ugly as normal, so it may be coming from the bundle or even junctional. 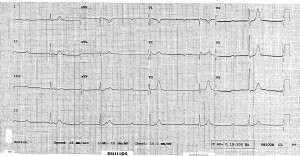 In my experience, a ventricular escape usually doesn’t respond to atropine or isoprenaline – it’s not really under much vagal control – and the issue with 3 rd degree AV block in the absence of a reversible cause like beta or calcium blockers is that the conduction delay is not just in the AV node, it’s in the damaged His and ventricles as well….usually meaning there is poor LV function to boot. HyperK is a great thought, I think it’s less likely because p waves should disappear reasonably early in hyper K.